The Addis Agenda notes that international tax cooperation should be scaled up in a way that is universal in approach and scope and fully takes into account the different needs and capacities of all countries. While for many years international tax cooperation focussed on the conclusion of bilateral tax treaties, which had the principle aim of reducing double taxation, in recent times such cooperation has increasingly looked at setting tax norms to close loopholes and limit the ability of multi-national enterprises (MNEs) to avoid paying taxes. As shown in the figure, the institutional environment for international tax cooperation is complex and overlapping. The United Nations and the OECD are the two principle venues for the development of international tax norms, particularly through the maintenance of model conventions and commentaries as well as codes of conduct and guidance to countries. Certain norms are agreed elsewhere, such as the Financial Action Task Force on beneficial ownership information. Out of the four institutions, the United Nations is the only one to harness universal membership. The OECD, while not a universal membership body, has worked with the G-20 group of countries and has established forums open for interested country to participate, such as the Global Forum on Transparency and Exchange of Information for Tax Purposes, which currently has over 140 members, and the Inclusive Framework on BEPS, currently with almost 100 members. The OECD also serves as a coordinator and overseer of implementation of its agreements and has designed a number of multilateral conventions and instruments. The United Nations and its agencies conduct international policy analysis, as do the OECD, World Bank and the International Monetary Fund. The IMF and World Bank also work at the national level on policy analysis and recommendations. Capacity building is a priority for all the actors. Notes: Examples of norm setting include model conventions and multilateral treaties. International policy analysis examples are research papers, handbooks, BEPS Action Plan reports. Oversight of implementation includes peer reviews and the assessment of compliance with international standards. National policy analysis and advice includes surveillance, assessment of tax administrations, and policy proposals. 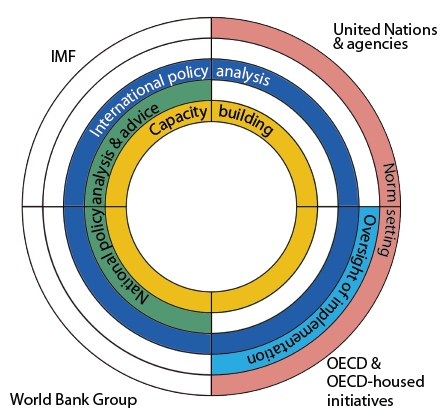 Examples of capacity building work are the OECD/UNDP Tax Inspectors without borders initiative, the Global Tax Program of the World Bank, the UN DESA Capacity Development Unit, the OECD Global Relations programme and IMF technical assistance. The IMF, OECD, United Nations and the World Bank Group are working together under the Platform for Collaboration on Tax, to enhance their cooperation and improve the support and assistance they provide to governments. The first report of the Platform focused on how to improve external assistance to revenue mobilisation and was released in July 2016 to the G20 Finance Ministers and Central Bank Governors. It focused on the key enablers for successful reforms, with the need for a supportive political environment and to place reforms in part of a medium-term strategy the main focus. The Platform continues to work on the toolkits identified by the BEPS and Low Income Countries report to the G20, with toolkits on indirect transfers of assets, addressing difficulties in accessing comparable data for transfer pricing (including mineral pricing), treaty negotiation and transfer pricing documentation - all due to be produced in the course of 2017. Further toolkits on BEPS risk assessment, base eroding payments and supply chain restructuring will follow in 2018. A medium-term revenue strategy (MTRS) initiative is being developed under the Platform for Collaboration on Taxation, following on from the report on Capacity Development presented by the Platform partners to the G20 in July 2016. The idea is to support a country undertaking a broad tax reform around an explicit multi-year plan —with political support from the highest levels, and with stakeholder consultation and involvement. An MTRS will be based around coordinated support from differing providers, according to their resources and comparative advantage, assuring that reform is properly sequenced and coordinated. Pilot projects are currently being prepared. We commit ourselves to promoting stronger cooperation to eliminate money-laundering.